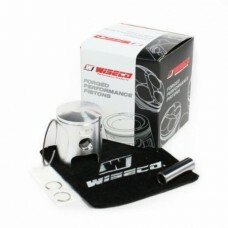 Includes Piston, rings, clips, and pin. Wiseco leads the performance aftermarket by producing the highest quality forged pistons for Dirt Bikes, ATV's, Snowmobiles, Outboard Marine, and Motorcycles in the USA. Wiseco is unique because they forge all of their own pistons in-house and also produce all of their own forge tooling in the USA. This allows them to control all aspects of the manufacturing process from raw bar to skirt coating finished parts.